Gabija Imbrasaite (Lithuania) is the winner of the Bioeconomy Bio-based Industries prize award in EUCYS 2018. 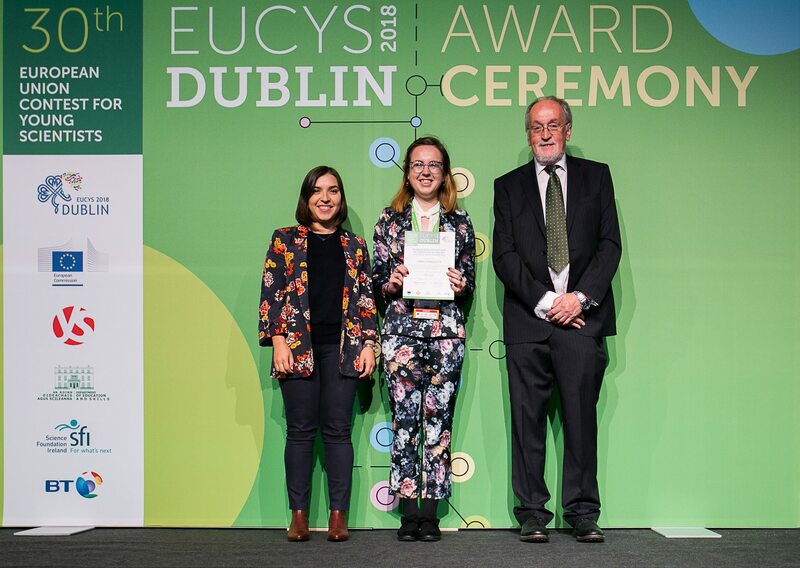 During the final ceremony of the EUCYS held in Dublin on 18 September her project 'Bioplastic film with Penicillium roqueforti for pear preservation' was selected by an international jury as an outstanding example of bio-based research developing a new generation of biobased products and processes for a more sustainable future. Her research developed a bioplastic film from gelatine, glycerol, and water, with introduced fungus from the blue cheese to prolong pears preservation time. Gabija (18 years old) was among 135 promising young scientists aged 14 to 20 from 38 countries and the European schools. They presented a total of 88 projects at the 30th edition of the EU Contest for Young Scientists over the last few days in Dublin and all the winners shared a total of €57.500 in prize money, as well as other prizes such as science trips. Every year the European Commision organises this contest to promote the ideals of co-operation and interchange between young scientists and to give them an opportunity to be guided by some of Europe's most prominent researchers. EUCYS serves as an annual showcase of the best of European student scientific achievement, giving students the opportunity to compete with the best of their contemporaries at European level. This EU Contest for Young Scientists is part of the Science and Society activities managed by the Directorate-General for Research & Innovation at the European Commission. The participants had all previously won first prizes in their home countries' national science competitions in their specific fields. The projects covered a broad spectrum of scientific areas, including biology, physics, chemistry, computing, social sciences, environment, mathematics, materials, engineering and medicine. Carlos Moedas, European Commissioner for Research, Science and Innovation, said: "I warmly congratulate the winners of this year’s contest on their fantastic achievement. It’s encouraging to see so much talent in these young researchers and innovators. They are our future – with their ground-breaking discoveries and innovations that are no doubt to come, we will be able to better tackle the great challenges and ensure our prosperity and well-being." More information on Gabija's project can be found here.